Nokia Siemens Networks reported progress in its efforts to deliver mobile voice core services via a virtualized telco cloud core. The company, which previously has demonstrated various use cases covering Voice over LTE (VoLTE) and other IP Multimedia Subsystem (IMS) based services in the Telco Cloud, said the technology is now on the brink of commercial deployment. The latest progress includes further testing to verify end-to-end VoLTE deployment readiness in a Telco Cloud. This testing involved end-to-end verification of VoLTE call cases to ensure feature parity with customers’ current 2G/3G circuit-switched voice services, Single Radio Voice Call Continuity (SRVCC) functionality, and the reuse of existing billing, lawful interception and intelligent network interfaces. During 2012, Nokia Siemens Networks demonstrated the reliability of core virtualization in several “proof of concept” projects. The company said these projects provided the technology foundation for core network element software running on top of a virtualized infrastructure. In addition, the projects helped identify telco-specific requirements for cloud computing. The testing used industry-standard virtualization and cloud management infrastructure as well as commercial off-the-shelf IT server hardware. "The range of test cases we ran during the pre-deployment verification phase underlines the essential role of the OSS components in the Telco Cloud,” said Peter Patomella, vice president, Operations Support Systems at Nokia Siemens Networks. "We’ve shown how the complete lifecycle of a network element can be managed remotely via our OSS – including initial network element cloud deployment, monitoring of virtualized VoLTE application resources, and elasticity management." Ericsson confirmed that South Korea's LG U+'s recently launched LTE-Advanced (LTE-A) commercial service network is using their equipment. Specifically, Ericsson has supplied Evolved Packet Core network and radio base stations and integrated new software for LTE-A service. The LTE-A rollout involved a Carrier Aggregation (CA) software upgrade. LTE-A supports up to 150 Mbps throughput – twice and 10 times the speed of LTE and 3G services. Furthermore, LG U+ is able to support voice and data both on the LTE-A network with upgraded data speeds and service quality. The two companies have agreed to jointly develop LTE-A and post LTE-A technology such as coordination functions between cells to enhance throughput by minimizing inter-node interference, inter-cell interference control technology to expand small cell coverage through coordination between macro and small base stations, and soft cell related technology to enhance data quality and speed by separating nodes for controlling signal and actual traffic data. On July 18th, South Korea's LG U + officially launched its LTE-Advanced service, promising download speeds of 75 Mbps to 150 Mbps -- roughly twice the performance of its standard LTE service. The LTE-A network is using carrier aggregation of 800 MHz and 2.1 GHz spectrum. Compatible handset initially include a version of the Samsung Galaxy S4 and soon the LG Electornics Optimus G2. By the end of the year, the company expects there will be six LTE-A terminal devices on the market. Hughes Network Systems reports carrier data rates exceeding 1 Gbps on its JUPITER System. "With this development, we are extending our JUPITER technology to maximize data throughput and achieve the industry's fastest VSAT," said Adrian Morris, executive vice president of Engineering and CTO, Hughes. "This capability positions us to continue to lead the market in delivering the most bandwidth-hungry applications that demand the highest speeds." Hughes' JUPITER powers its newly launched HughesNet Gen4 service, which was launched in October 2012 and is credited with accelerating growth of the total HughesNet subscriber base in the U.S. to approximately 700,000 subscribers, making it the world's largest satellite Internet service. 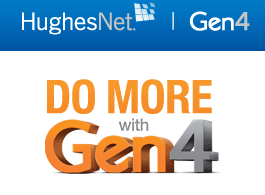 HughesNet Gen4 delivers downlink speeds from 10 to 15 Mbp. It also features a VoIP voice calling option. HughesNet Gen4 Business Internet is powered by the EchoStar XVII satellite with JUPITER high-throughput technology -- a next-generation Ka-band satellite employing a multi-spot beam architecture. It is designed to provide well in excess of 100 Gbps capacity to HughesNet across North America. Its multi-spot beam architecture will expand coverage and focus capacity on the areas with the highest traffic demand. It uses the Space Systems/Loral 1300 platform and is designed to provide service for 15 years or longer. The satellite is in a circular orbit 22,300 miles above the equator at 107.1 degrees West longitude. 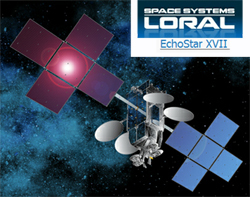 In July 2012, EchoStar XVII was launched aboard an Ariane 5 rocket from the European Spaceport in Kourou, French Guiana. ViaSat confirmed that it has been granted a Blanket License Radio Station Authorization by the FCC for Ka-band aeronautical earth stations, enabling it to deliver airborne Ka-band services over all 50 U.S. states. The 15-year, renewable license permits operation of the ViaSat Mantarray, low-profile airborne antenna on the ViaSat Ka-band satellite fleet of ViaSat-1, WildBlue-1, and Anik-F2. "This is the first license of its kind in the world," said Mark Dankberg, ViaSat chairman and CEO. "We're gratified to see the FCC recognizing that the advanced technical design of this equipment is compatible with the operating environment in which our other Exede services successfully operate. Now airlines, and their passengers, will have access to an unprecedented amount of bandwidth. We want to let everyone on board be connected at high speed." 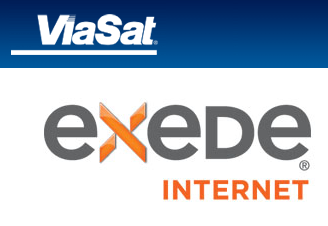 ViaSat is preparing to launch its "Exede In The Air" in-flight broadband service this fall with initial availability on the U.S. fleets of JetBlue Airways and one other major airline. Approximately 400 aircraft are already under contract to receive the service. ViaSat also initiated work with the European Conference of Postal and Telecommunications Administrations (CEPT) two years ago that led to a related Electronic Communication Committee decision in March, allowing mobile earth station operation – including in the Ka-band – in participating countries in Europe. The service will be powered by ViaSat-1, which holds the title of the World's Highest Capacity Communications Satellite to date with 134 Gbps of total throughput capacity. 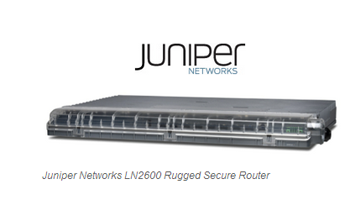 Juniper Networks introduced its LN2600 ruggedized router for deployment in harsh environments where dust, heavy vibration, moisture and extreme temperatures are often the norm. It could be used for connecting remote telemetry units, surveillance cameras, programmable logic controllers and other intelligent devices. The router combines switching, routing and security into a single platform, and contains no vents or other openings to keep it dust-free and splash-resistant. Marvell is the silicon supplier for Google's new Chromecast device which delivers online content directly to the HDMI port of a TV. 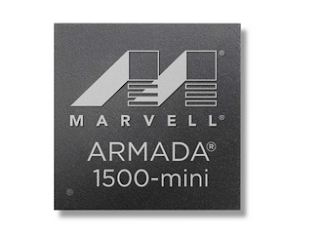 The new ARMADA 1500-mini is optimized to support low-power applications such as TV dongles while being extremely energy efficient. It supports 1080p decode and has a high security grade enabling multiple DRM solutions like Widevine and Playready. Marvell said its advanced Wi-Fi solution enables easy set up. "I am very excited to see the brilliance of the tiny and beautiful Chromecast. I believe this is truly a game-changing solution to drive the new era of the 'Connected Lifestyle' by enabling easy access to online entertainment for an immersive, interactive multi-screen experience across any smartphone, tablet, laptop and big screen. I am very proud of Google's leadership in driving the ecosystem partners to deliver more powerful and very affordable solutions to serve the world of consumers for better lives," said Weili Dai, President and Co-Founder of Marvell. 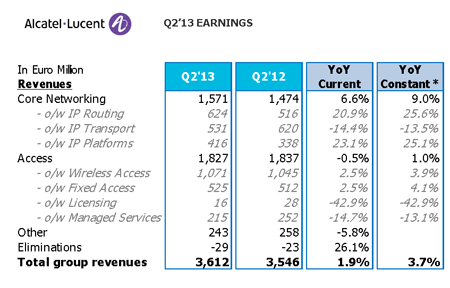 Alcatel-Lucent reported Q2 revenues of Euro 3,612 million, up 1.9% year-over-year, up 3.7% year-over-year at constant currency. “We are at the beginning of our journey towards 2015 and cash remains a challenge. Looking ahead, our clear focus will be maintaining a strict and disciplined approach to implementing The Shift Plan across all of its industrial, operational and financial dimensions," stated Michel Combes, CEO Alcatel-Lucent. Gross margin for Q2 came in at 31.9% of revenue for the quarter, compared to 31.8% in the year ago quarter and 29.4% in the first quarter 2013. The sequential increase in gross margin mainly resulted from higher volumes and favorable product mix. Operating expenses decreased -4.4% year-over-year on a reported basis and -4.3% adjusted for constant currency. There was a net loss (group share) of Euro (885) million or Euro (0.39) per share, including restructuring charges of Euro (194) million, an impairment charge of Euro (552) million resulting from the impairment test review of assets carried at the end of the second quarter 2013, using assumptions consistent with The Shift Plan documentation, and Euro (180) million of financial loss, which included Euro (108) million of interest charges, Euro (26) million of net loss on debts repurchased during the quarter and Euro (24) million of pension and OPEB financial component. Revenues for Networks & Platforms were Euro 3,063 million, an increase of 5.9% compared to Euro 2,891 million in the year-ago quarter and a 12.9% increase compared to Euro 2,713 million in the first quarter 2013. At constant currency exchange rates, Networks & Platforms revenues increased 8.1% year-over-year and increased 12.5% sequentially. Revenues for the IP division were Euro 624 million, increasing 20.9% from the year ago quarter and 25.6% at constant currency, driven by strength in edge routers and carrier ethernet switches across all regions, especially in the US and APAC, as well as a return to growth in EMEA. The new 7950 XRS platform has a total of 10 wins and more than 20 trials to date. Nuage Networks has a number of active trials. Revenues for the Optics division were Euro 422 million, a decrease of 7.0% from the year-ago quarter. 100G shipments now represent 27% of total WDM line cards shipments in Q2’13, compared to 19% in Q1’13. Revenues for the Wireless division were Euro 1,010 million, a decline of 1.1% from the year-ago quarter. Strong growth in LTE and RFS was offset by an overall decline in 2G/3G technologies. CDMA revenues now represent approximately 20% of wireless revenues, and for the first time were surpassed by LTE revenues, as the US continues to drive growth in LTE. Revenues for the Fixed Networks division were Euro 468 million, an increase of 3.3% from the year-ago quarter, reflecting continued strong growth in copper, especially in the US and Europe. This was partially offset by weakness in ONT fiber products, representing now less than 30% of fixed networks products. VDSL2 vectoring products are now being used by 13 customers, including 2 new contracts in the second quarter, in addition to be involved in more than 45 trials. Revenues for the Platforms division were Euro 262 million, an increase of 23.0% from the year-ago quarter. Revenues for the Services division were Euro 285 million, an increase of 22.3% from the year-ago quarter. Strong growth continued in Network Build and Implementation (NBI) as well as Integration Services, both of which benefitted from network rollouts in the US. Revenues from Focused Businesses decreased -18.3% in the second quarter with declines in both Enterprise and Submarine businesses. Revenues in the Managed Services business were Euro 215 million, a decrease of -14.7% compared to Euro 252 million in the year-ago quarter and an increase of 5.4% compared to Euro 204 million in the first quarter 2013. 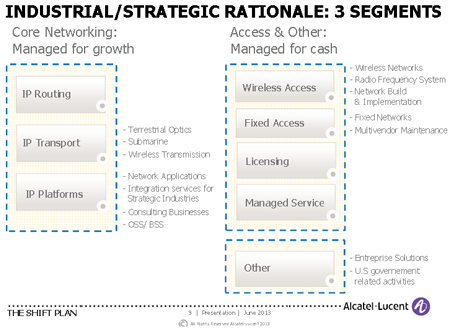 In June, Alcatel-Lucent outlined a "Shift Plan" aimed at transforming the company from a generalist supplier of networking solution into a specialist provider of IP Networking and Ultra-Broadband Access. The company is targeting Euro 1 billion in reduced sales, general and administrative (SG&A) expenses over the next three years as it makes a decisive in its industrial focus toward high-value equipment and services. Current business segments outside of this new area of focus include Terrestrial Optics, Submarine, Wireless Transmission, Network Applications, Integration Services for Strategic Industries, Consulting Businesses and OSS/BSS. Lift operating margins from 2.4% in 2012 to more than 12.5% in 2015. IP, cloud and ultra-broadband portfolio at the center of operations, including WDM, 100G, IMS and customer experience product lines, as well as the 'FTTx' group of fiber-based connectivity technologies serving homes, businesses and other types of premises, vectoring, the 4G LTE mobile wireless access and small-cells. Bell Labs will continue to be the company's innovation engine, with an 8% increase in R&D from 2013 through 2015. IP and Ultra-Broadband Access will represent 85% of R&D investment in 2015. Alcatel-Lucent's intellectual property portfolio will become a dedicated profit center and will adopt an entrepreneurial approach to licensing in order to develop a solid revenue stream from its library of more than 30,000 patents and 16,000 applications. On a cash basis, The Shift Plan is expected to be self-funding over the 2013-2015 period. Once the company has clearly demonstrated the successful execution of the Shift plan, it plans to seek a reduction of its debt by approximately Euro 2 billion including through further asset disposals or through access to the equity markets in order to support its long-term strategic goals. The company did not announce any further job cuts at this time although reductions are planned. Alcatel-Lucent will reduce the number of countries in which it operates from 185+ to 145 countries. It will go from 100+ sales offices to 75 sales offices. It will consolidate warehouse and purchasing locations. The company will undertake a 40% cut in real estate and sites, reducing its footprint in non-strategic locations. In Manages Services, the company will address its 15 unprofitable contracts. Extreme Networks reported quarterly revenue of $79.5 million, representing a 16.5% increase compared to the prior quarter's revenues of $68.2 million and a 9.4% decrease compared to revenues of $87.7 million in the same period a year ago. GAAP net income for Q4 was $3.2 million, or $0.03 per diluted share, an increase of $5.4 million, or $0.05 per diluted share compared to the previous quarter. "We are pleased with the significant sequential quarter over quarter growth in revenues and operating income, which is indicative of the strength of our product offering," said Chuck Berger, president and chief executive officer of Extreme Networks. "Our extensive line of Ethernet switches, reaching from the edge of the campus to data centers, all running on the most robust network operating system in the industry, have strong appeal to customers and partners. That said, we continued to report year over year declines in revenues, which clearly indicates there is much to be done to improve our execution across the board. We have identified the areas where changes are needed and are making solid progress, but it will take several quarters to realize the full benefit of these efforts. Additionally, as in our third fiscal quarter, we were unable to fulfill a significant amount of orders due to reduced inventory levels and lengthening component lead times. We will continue to face these shortages for the first half of the first quarter, but believe we will have caught up with demand as we go into September." Ixia's Q2 revenues grew 28% to $115.9 million, compared with $90.7 million reported for the 2012 second quarter. The 2013 second quarter includes $33.2 million in revenue from the recent acquisitions of Anue Systems, and BreakingPoint Systems, which closed in June and August 2012, respectively. Q2 net income (GAAP) was $3.8 million, or $0.05 per diluted share, compared with net income of $25.7 million, or $0.32 per diluted share, for the 2012 second quarter. Non-GAAP net income for the 2013 second quarter was $14.5 million, or $0.18 per diluted share, compared with non-GAAP net income of $12.9 million, or $0.17 per diluted share, for the 2012 second quarter. The L2-3 Ethernet Switch market is forecast to approach $25 billion in 2017, with future growth to be driven primarily by sales of higher speed Ethernet switches optimized for larger data center deployments, according to a recent report from Dell'Oro Group. The report expects a quick migration to 40 Gigabit and 100 Gigabit Ethernet at the core of the data center. The report also shows that Fixed and Modular 10 Gigabit Ethernet port shipments are expected to expand beyond the data center to campus devices, such as high-end workstations and 802.11ac access points. "The data center will be the site of almost all revenue growth during the forecast horizon, as the Cloud forever changes how networks are built. In general, we are moving toward a period of data center consolidation and change, where there will be fewer, larger, data centers and the ownership of data center equipment will change," said Alan Weckel, Vice President at Dell'Oro Group. "At the same time, single vendor wins at these large data centers will be sufficient to shift market share in the overall market as well as vendor ranking in individual segments. We expect many large-magnitude Cloud wins throughout the forecast period and believe a dominant Cloud provider could apply significant pricing pressure on this market and the vendor(s) it selects," Weckel stated. Riverbed Technology reported Q2 revenue of $250 million, compared to $198 million in Q2 2012, representing 26% year-over-year growth. GAAP net loss for Q2'13 was $16.5 million, or $0.10 per diluted share, compared to GAAP net income of $18.1 million, or $0.11 per diluted share, in Q2’12.